2019 Jetta S Manual Transmission VIN: KM045841, MSRP: $19,845. Offer requires $0 down payment, $0 first month’s payment, $0 security deposit. Tax, tag, title, $20 third-party tag agency, $299 electronic filing fee, $675 acquisition fee, and $899 dealer fee due at lease signing. Monthly payment is plus tax. Based on a 39-month lease with 7,500 miles per year. Limited availability at this price. Must qualify for all applicable rebates. Offer valid with approved credit through VW Credit, Inc. Offer cannot be combined with any other offer, sale, promotion or advertisement. Picture for illustration purpose only. See Gunther Volkswagen for complete details. Offer expires April 30, 2019. 2019 Passat Wolfsburg Edition VIN: KC010091, MSRP: $27,425. Offer requires $0 down payment, $0 first month’s payment, $0 security deposit. Tax, tag, title, $20 third-party tag agency, $299 electronic filing fee, $675 acquisition fee, and $899 dealer fee due at lease signing. Monthly payment is plus tax. Based on a 39-month lease with 7,500 miles per year. Limited availability at this price. Must qualify for all applicable rebates. Offer valid with approved credit through VW Credit, Inc. Offer cannot be combined with any other offer, sale, promotion or advertisement. Picture for illustration purpose only. See Gunther Volkswagen for complete details. Offer expires April 30, 2019. 2019 Tiguan S VIN: KM073270, MSRP: $25,375. Offer requires $0 down payment, $0 first month’s payment, $0 security deposit. Tax, tag, title, $20 third-party tag agency, $299 electronic filing fee, $675 acquisition fee, and $899 dealer fee due at lease signing. Monthly payment is plus tax. Based on a 39-month lease with 7,500 miles per year. Limited availability at this price. Must qualify for all applicable rebates. Offer valid with approved credit through VW Credit, Inc. Offer cannot be combined with any other offer, sale, promotion or advertisement. Picture for illustration purpose only. See Gunther Volkswagen for complete details. Offer expires April 30, 2019. 2019 Atlas SE V6 VIN: KC507539, MSRP: $39,125. Offer requires $0 down payment, $0 first month’s payment, $0 security deposit. Tax, tag, title, $20 third-party tag agency, $299 electronic filing fee, $675 acquisition fee, and $899 dealer fee due at lease signing. Monthly payment is plus tax. Based on a 39-month lease with 7,500 miles per year. Limited availability at this price. Must qualify for all applicable rebates. Offer valid with approved credit through VW Credit, Inc. Offer cannot be combined with any other offer, sale, promotion or advertisement. Picture for illustration purpose only. See Gunther Volkswagen for complete details. Offer expires April 30, 2019. 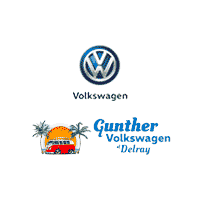 Thank you for making your way to Gunther Volkswagen Delray Beach, your certified Volkswagen dealer serving drivers throughout Delray Beach and the surrounding areas. At our dealership, you’ll find a solid selection of new Volkswagen for sale, as well as a carefully inspected lineup of pre-owned vehicles. We also have a well-connected finance center run by a qualified team of finance experts, who can help you get the right loan or lease in a quick, easy, and transparent manner. Our commitment to our customers continues well beyond the date of purchase. We also have a professional team of Volkswagen technicians on hand with the skills and equipment to handle all manner of maintenance and repairs, as well as a full stock of authentic parts. Make your way to Gunther Volkswagen Delray Beach in Delray Beach today for quality vehicles, a friendly team, and professional service at every step of the way. And if you have any questions for us, you can always get in touch at 561-513-5243.